If you’re looking for an alternative lifestyle approach to help people prevent or even reverse heart disease, Dean Ornish, MD, may be your man. Ornish has been mounting an aggressive campaign against heart disease, the No. 1 killer in the United States, for the past three decades. Widely known in health and wellness circles, the Ornish program is a unique dietary and lifestyle plan that has been proven to prevent and even reverse heart disease. Ornish’s reputation has been heightened by the publication of six best-selling books, including Dr. Dean Ornish’s Program for Reversing Heart Disease, Eat More, Weigh Less,and Love & Survival. He also writes a monthly column for Newsweek and maintains a health and diet page on WebMD. Ornish founded the nonprofit Preventive Medicine Research Institute in Sausalito, Calif., which aims to educate health professionals about the benefits of lifestyle change. If that’s not enough, Ornish adds a long list of accomplishments and acknowledgements to his resume, including serving as former President Bill Clinton’s personal physician consultant and being named by LIFE magazine as one of the 50 most influential members of his generation. No wonder people have come to say “Ornish” and “heart disease prevention” in the same breath. So what’s the Ornish plan all about? Today’s Dietitian sat down with Ornish to explore his lifestyle modification program, which focuses on a diet low in fat and rich in unrefined plant foods; regular, moderate exercise; stress management; and social support. These strategies are effective for preventing and even reversing heart disease, preventing other chronic diseases, managing weight, and promoting optimal health. Ornish believes everyone is faced with making a personal choice about how comprehensive his or her lifestyle changes need to be along a spectrum of healthy behavior, which is the theme of his latest book, The Spectrum: A Scientifically Proven Program to Feel Better, Live Longer, Lose Weight, and Gain Health. “The premise of the book is that it kind of personalizes the way of eating based on your own needs, genes, and preferences. If you’re trying to reverse heart disease and cancer, it does require bigger changes. It takes more to reverse [disease] than it does to prevent [it], so The Spectrum shows people how they can personalize a way of eating and living. If you’re just trying to lose a few pounds or get cholesterol down, you can start by making more moderate changes and make bigger ones if you don’t want to be on Lipitor for the rest of your life,” says Ornish. What makes his program stand out from the onslaught of ubiquitous diet books is that Ornish supports his advice with hard-won science; his research is published in leading medical journals. “For the past 31 years, I’ve conducted a series of studies that were able to prove for the first time that the progression of even severe heart disease often can begin to reverse when people make comprehensive changes in diet and lifestyle. At the time that we began doing this work, that was thought [to be] impossible,” he says. Ornish gives a snapshot of his scientific findings on the lifestyle program, starting with a pilot study of 10 patients in 1977 showing that his program made an improvement in blood flow to the heart in only one month. In 1983, The Journal of the American Medical Association published a randomized, controlled trial that showed the heart’s ability to pump blood improves significantly in only one month. The first randomized trial that demonstrated even severe coronary artery blockages could reverse in only one year was published in The Lancet in 1990. Five-year findings were published in The Journal of the American Medical Association in 1998, indicating that there was even more reversal after five years than after one year. Ornish reports that the five-year results showed an average improvement to the heart of more than 300% and 2.5 times fewer cardiac events. Based on these findings, Ornish pushed forward to conduct a series of three demonstration projects to determine how practical his approach could be in different parts of the country and whether it could be both cost-effective and medically effective. “We’ve treated in almost 50 hospitals. We’ve shown that we can motivate people to make and retain bigger changes in diet and lifestyle than previously reported, achieve better clinical outcomes and also larger cost savings. We’ve done three demonstration projects. We found that there was an average savings of almost $30,000 per patient in the first year. And most people who were told that they needed to have bypass surgery or angioplasty were able to safely avoid it by changing lifestyle in our program as an alternative step. We did a randomized control study also and found that they cut overall cost in half in the first year and by an additional 20% to 30% in years two and three. And Medicare is now covering our program as part of their own demonstration project,” says Ornish. He’s excited about the direction of his recent research, which discovered that his lifestyle program can even change how genes are expressed. Two years ago, The Journal of Urology published Ornish’s research showing that in men who had early-stage prostate cancer, the program could stop or even reverse the disease. “Most recently, we published in the Proceedings of the National Academy of Sciences in May 2008 and in The Lancet Oncology [November 2008] that the same program can actually change how your genes are expressed. We found that in just three months, over 500 genes were favorably expressed or favorably changed. We published the first studies in The Lancet Oncology showing that in three months, we can increase telomerase by almost 30%, and telomerase is the enzyme that repairs telomeres.” Telomeres are protective DNA-protein complexes at the end of linear chromosomes that promote chromosomal stability. Telomere shortness in humans is emerging as a marker of disease risk, progression, and premature mortality in many types of cancer. “No one has ever shown that anything, even drugs, can do that, and we showed that in just three months, this occurred. These are the kinds of findings that can really capture people’s imagination and make them say, ‘Wait a minute. You mean that if I change my lifestyle, I can actually change my genes in just three months? My genes are not my fate? These mechanisms are so much more dynamic than I once realized?’ The answer for most people is, ‘Yes.’ I think these findings might be of real value to people,” says Ornish. At the root of Ornish’s program for battling heart disease is the philosophy that it’s better to prevent or even reverse disease through lifestyle than by invasive, costly, and ineffective procedures and medications. Ornish refers to a recent New England Journal of Medicine study that found that in patients not in the middle of having a heart attack—accounting for about 90% to 95% of the angioplasties and stents performed—such procedures do not prevent heart attacks or prolong life. Ornish notes that similar results have also been found with bypass surgery. “On one hand, the conventional approach is bypass surgery and angioplasty, which costs tens of billions of dollars every year and [is] dangerous and largely ineffective, yet the simple choices that we make in our lives each day—like what we eat, how we respond to stress, how much exercise we get, whether or not we smoke, and how much social support we have in our lives—can prevent or even reverse this disease,” stresses Ornish. The Ornish diet focuses less on counting calories than it does on choosing foods wisely. And these food choices depend on what each individual hopes to accomplish. On one side of the spectrum is the prevention diet, which can be customized according to an individual’s goals and health risks. On the other side of the spectrum is the reversal diet for people with diagnosed heart disease and high blood cholesterol levels. Guidelines for both diets focus on lowering intake of high-fat animal proteins such as red meat, pork, and full-fat dairy products while increasing consumption of complex carbohydrates such as fruits, vegetables, whole grains, legumes, nonfat dairy products, soy products, and egg whites. Moderate amounts of fish, skinless chicken, avocados, nuts, and seeds are included. Ornish also recommends omega-3 fatty acids in the form of supplements. The reversal diet takes these guidelines to the more restrictive side of the spectrum, while the prevention diet affords more discretion, depending on the individual’s goals. 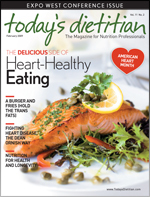 Ornish’s nutritional guidelines for reversing heart disease include consuming no more than 10% of calories from fat; following a mostly plant-based diet; consuming no more than 10 milligrams of cholesterol per day; eliminating meat, fish, poultry, and caffeine, with the exception of green tea; consuming sugar, sodium, and alcohol in moderation; and eating one daily serving of soy foods. With news of the heart-health benefits of the Mediterranean diet, which stresses moderate fat intake and focuses on monounsaturated fat, some critics have called Ornish’s diet too low in fat. But Ornish disagrees, reiterating: “The premise of The Spectrum is that it kind of personalizes a way of eating based on your own needs, genes, and preferences. If you’re trying to reverse heart disease and cancer, it does require bigger changes. The Mediterranean diet has never been shown to reverse heart disease. If you’re trying to reverse genes, most people don’t go far enough. It takes more to reverse than it does to prevent, so The Spectrum shows people how they can personalize a way of eating and living. Critics have also called the Ornish diet difficult to maintain. But Ornish believes most people can make the lifestyle changes needed to live a healthier life. “If you say no one would want to change their diet, then why would they anyway? Because you can take Lipitor and the patient doesn’t change, but the compliance of Lipitor is actually very poor. The evidence shows that two thirds of people prescribed with any statin drugs are not taking them just four months later because you’re asking patients to take a drug that isn’t making them feel any better. But there’s really something bad happening down the road that they don’t want to think about, so they don’t take them. When you change your lifestyle, most people find that they feel so much better quickly, particularly when they have heart disease. People who are otherwise healthy think more clearly because their brain gets more blood, they have more energy, and studies have shown that you grow so many brain neurons in three months that your brain actually gets bigger,” he says. “When you exercise or eat healthier, your heart gets more blood, and your sexual organs get more blood. So for many people, these are choices worth making, more importantly, to live better. Patients feel so much better so quickly when they make these changes. “The most common misconception is that I recommend a very strict diet for everyone, and that’s never been the case. But we also need to not patronize our patients and say, ‘I know you couldn’t change; it’s just too hard.’ Somehow, the idea that cutting someone’s chest open and doing bypass surgery is conservative and asking people to walk, meditate, and quit smoking is radical is crazy to me. Whether someone wants to make a change is a very personal decision. I don’t tell people what to do, but I do treat people with respect and say, ‘Here is an option. Here are the risks, benefits, costs, and side effects of different approaches. What do you want to do?’” says Ornish, who reports that data on Medicare patients throughout the country indicate that most people with the proper support think they can comply with the lifestyle program and have been able to do so. • Diet: Focus on lowering intake of high-fat animal proteins, including red meat, pork, and full-fat dairy products; increase consumption of complex carbohydrates such as fruits, vegetables, whole grains, legumes, nonfat dairy products, soy products, and egg whites; and eat moderate amounts of fish, skinless chicken, avocados, nuts, and seeds. • Exercise: Minimize the amount of inactivity, increase the general level of activity, and make exercise an integral part of daily life. Include at least 20 minutes of daily aerobic exercise, with frequency, intensity, time, and type adjusted according to the individual’s needs. • Stress management: Techniques include stretching, relaxation, breathing, imagery, and meditation. Practicing stress management techniques, developing a relaxation routine, locating a safe and quiet place to relax, finding a good time of the day for relaxation, and creating a positive mental attitude about relaxation daily are key. • Social support: Emphasize one hour of social support each week with goals such as improving communication skills and becoming more aware of one’s feelings. Activities include spending more time with friends and family, group support, confession, forgiveness, redemption, compassion, altruism, service, psychotherapy, touching, commitment, and meditation. For more information and to view Ornish’s published findings, visit the Preventive Medicine Research Institute at www.pmri.org.